Randy Ayers Nascar Modeling Forums :: View topic - Another mprmprmpr Decals/printer update. Posted: Wed Sep 12, 2018 8:16 am Post subject: Another mprmprmpr Decals/printer update. Well, I've done it again. I can never leave well enough alone, and or I'm a glutton for punishment. I just purchased another new (and better) printer for printing my decals. The big difference is that this one will print the color over the white underlay like traditional decals on one sheet. So no more dealing with two sheets, one color and one white sheet. Some people, myself included, don't mind that method, but some aren't fond of it. I will be able to supply an underlay sheet for dark colored cars if needed. Better quality, easier to use. Win, win IMO. And once again the new printer is not a cheap endeavor. I will be selling my old Oki C711WT on eBay at some point in the near future once I get the new set up up and running. If anyone here is interested in the old printer set up PM me. I will do a great deal if anyone here is interested and also give training on how to use it. They can be tricky if you don't know how to set them up to print decals, especially the white layer. Keep in mind with this set up it is a two sheet process. One color and one white. I understand........my catalog is around 250 different sets.....and I need to make a call soon myself. I either gotta spend some cash...or shut it down. Congrats, thanks again for the hookup. Will be in touch soon for an order. Yay!!! ok Mark, I'm ready to order when you're ready to print. Others can say what they want, but I'd rather use your decals over everything else I've tried so far, I've never had an issue with your product and they lay so good and lay tight and wrap perfectly. Text me when you're ready for an order . I should have the printer early next week. Tracking shows it arriving on Monday. It'll probably take me a few days to get it sorted out. I'll keep you, and everyone else posted. Looking forward to the product..
what type printer are you getting? Awesome news Mark. I always look forward to your decals. The eagle has landed. Hopefully I'll have some time tonight to start figuring this thing out. I'll post any progress and or some pictures of test prints when I have them. Fingers crossed. I got the printer put together, set up, installed drivers, etc last night. Ran a test page and a few simple color sheets. Tonight I start working on printing with white. Hopefully it will go smooth. I'm not a fan of scanning decal sheets and reprinting them. For one, that's how my decals (and others) are ripped off and re sold. Plus, the quality is never great. In the past I have re-engineered old sheets by using the old sheet as a template and re doing all of the artwork from scratch. Not a quick or easy process but that is one way of reproducing an old sheet. Plus they can be tweaked, corrected and improved. I guess I am late to the Party but what name are you decals sold under? Agreed...I can draw new art faster than clean up a scan of old decals. Getting close. A small setback that has nothing to do with the printer. A second supplier I use for is laser paper compatible with this printer has also discontinued this type of paper. I still have a few other options though. Quick update... I had an issue with one of the toner drums and of course it was the white drum. I was getting a sensor error that wouldn't allow me to print white. I had to send it back for them to look at. They got back to me this morinig and told me it looks like it may have been damaged in shipping so they are sending me a new one free of charge. I should have it in the next day or two. I'll update again once I have it and start running some test prints. 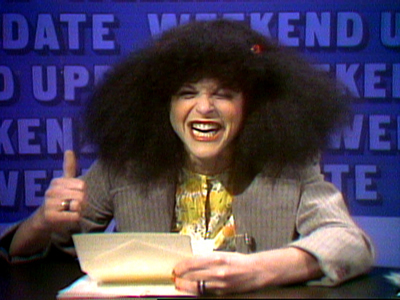 Roseanne Roseannadanna : It's always something! I understood what you meant, I was just saying "decal scanning" makes decal makers cringe. We've all been ripped of that way. It's generally easier to just start from scratch. I received the toner and drum today so I'm back in business (no pun intended). I'll be doing some testing with the white toner tonight. Updates to follow. Okay, I've finally had some time to work with the new printer. I've been experimenting and printing test sheets and I'm really happy with the results. With more time and practice I may get even better results, although they look great right now. But I'll keep trying new things to see if I can improve on it. Being able to print white under the color is a game changer, and makes the color graphics look better and pop more. I'm a little disappointed with the white when it's a stand alone graphic as of right now. It is much better than before, but could be better so I'll keep working at it. To to remedy that I will be including white underlays for the white and lighter color graphics on some of the sheets where it's needed. That way the white and light colored graphics will be much more opaque and it will help with bleed thru issues. It will effectively be two layers of white. I was hoping to be able to print all of my decals on single sheets but for right now some will still require a separate underlay sheet even with the white layer printed under the color. It will cost me more to print this way but it will result in better decals and I will be keeping the price the same as before. The biggest worry right now is decal paper. It seems that all of the US suppliers have stopped selling laser paper that is compatible with this type of laser printer. It's the same paper used for Alps printers. I currently found a new supplier in China but it would be much easier to find another source in the USA. Anyway, for better or worse, I'm going forward with the new printer until or unless something better comes along that I can afford. Hopefully I'll get this one paid off before that happens. LOL. Glad to hear you are getting things under control, will be in touch shortly for an order. On the stand alone white you may have to do a second layer of Opaque White but it must be printed last as no other printing will stick to it. With my printers typically a second layer of plain white will combine with the first layer and end up very spotty. What printer are you using? What toner? I havent had that issue.. I'm laser printing all of my decals now. I haven't used an Alps for years, although I still have one. The downside to laser printing white is the expense of both the printers and the white toner. But they are much more durable than and Alps printer and can print at a higher resolution. The laser printed decals themselves are more durable than Alps printed decals. So I'm going to keep moving forward with my laser printer. I'm not bashing Alps printers, I used them for years and you can produce great decals with them. Laser is just a better option for me. I'm currently using a modified Oki C711WT printer. As I said, they are expensive. With the modifications and software the are about $3500. I sure hope I sell lots of decals. I sell under the name mprmprmpr decals. They are only available through Mike's Decals and myself. I just got a sheet of Mark's new decals the other day. Thanks again Mark! What I can say is they are really well done! Much higher resolution that they were. The new decal paper that he is using allows them to lay down and conform to the model very well. One thing I can say is I am glad he provided me with a set of white underlay decals to put on the darker areas. With them and the decal it all but eliminated the bleed through. Unfortunately I have no means to upload photos here and I'm not going to pay a site to allow me to do it, otherwise I'd post pics of the build I used them on. Keep an eye out on the Facebook groups for me I will post there this afternoon after I get home from work. I'm building Dale Jr's Valvoline throwback with the decals he sent to me. Will not be the last set I get from Mark, that's for sure. The new decals are leaps and bounds better than his old ones, so if you enjoyed those, you'll love these. Thanks for the kind words. I'm really happy with then new decals. The new setup does make for better decals. And I could probably "get away" without the underlays with this printer, but the final product is so much better with them so I'm going to still supply them. Over some colors they may not be needed but I will include them with all of my decals with the exception of cars that have a white base color. 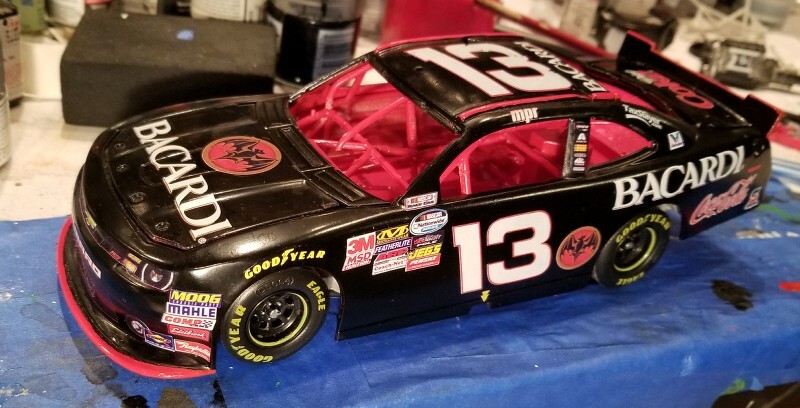 Here's a fantasy diecast I'm working on using decals made with the new printer. I haven't cleared it yet. Even with the crappy cell phone pictures you can see that the white is very opaque and the colors pop. The picture is a little washed out, but you get the idea. Can you guess what I'll be drinking tonight??? LOL. Sure thing, Can't wait to see what else you will come up with. Looks very nice......hope you sell lots of decals. Fantastic work, and you've definitely gotten the hang of the new printer! Bacardi and Coke on a Friday night sounds like a good idea. I am curious what the new printer you got, can you give me a link or model name/number ?